Nicholas Bucknall was educated at St.Paul’s Cathedral Choir School, London and Wells Cathedral School, Somerset. His career as a musician could be said to have begun as a chorister at St.Paul’s. It was an eventful period: during his time there he sang at the state funeral of Sir Winston Churchill and President Kennedy’s memorial service. He studied the clarinet with Alan Hacker at the Royal Academy of Music from 1969 to 1973 and was subsequently awarded a Churchill Memorial Trust Travelling Fellowship, enabling him to further his studies in Holland and Germany with Piet Honingh (Amsterdam Concertgebouw) and Karl Leister (Berlin Philharmonic). On the fellowship he also received tuition from Hans Deinzer, Heinrich Geuser, Hans Schoneberger and Jost Michaels and met various important instrument makers including Herbert Wurlitzer, Walter Puchner and Fritz Graesel. Since that time he has worked as a freelance musician in London, working with many orchestras and ensembles alongside studio engagements. Soundtrack recordings began for him with Edward Williams’ music for David Attenborough’s BBCTV series ‘Life on Earth’ and many of Carl Davis’ scores for television including ‘Private Schultz’ and ‘The Old Curiosity Shop’. 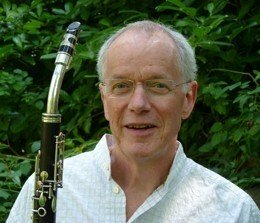 As principal clarinet of the Wren Orchestra he took part in numerous silent film performances for Carl Davis, including Abel Gance’s epic six hour ‘Napoleon’. In the early Eighties Nicholas co-directed, with Alan Hacker, the Whispering Wind Band, a wind nonet, for which ten new compositions were commissioned. He was also musical director of a production of Vanbrugh’s ‘The Relapse’ at the Old Vic Theatre. At various times he has been a regular guest principal with the Chamber Orchestra of Europe, the Philharmonia, the BBC Symphony Orchestra, the Academy of St.Martin in the Fields, the City of London Sinfonia, the Britten Sinfonia and the English Chamber Orchestra, in addition to performing on period instruments as principal of Sir Roger Norrington’s London Classical Players and as guest principal with the Orchestra of the Age of Enlightenment. In contrast he was a member of the contemporary music orchestra Sinfonia 21 and with them took part in many premieres and broadcasts including a performance of Steve Reich’s ‘New York Counterpoint’ at St. John’s, Smith Square, broadcast on BBC Radio 3 in May 2000. 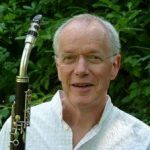 Versatility is often the key to a varied musical diet and to that end Nicholas employs numerous members of the single reed family – the basset clarinet, for example, for Mozart’s Concerto and Quintet (also performing the aria ‘Parto! Parto!’ with Dame Janet Baker at the Barbican, London and recording ‘Non piu di fiori’ with Cheryl Studer – the two arias with obligati parts for basset clarinet and basset horn respectively from ‘La Clemenza di Tito’). He has broadcast Telemann and Vivaldi concerti with the OAE using the chalumeau and played the tarogato on the score for the film ‘Jakob the Liar’. Both instruments were used for the film ‘Beloved’. Period clarinets that he has used in the London Classical Players and the OAE range from copies of late 18th century Viennese Taubers, early 19th century Grenser instruments (classical/early romantic) through Brahms period Ottensteiners to original Albert simple systems of 1885 and Oskar Oehlers of about 1920. For many years his main instruments for modern orchestral and studio work were Reform Boehm clarinets stamped Ernst Schmidt and K.Hammerschmidt dating from about 1950. More recently he played on 1941 Schmidt / Fritz Wurlitzer one-piece instruments and since late 2014 he is using a pair of new Schwenk & Seggelke clarinets.